The room had been turned into a slaughterhouse: pages, torn and crumpled, lay everywhere and amongst them her blood shot eyes were concentrating devilishly on the new project. It is a condition, I had said to her earlier in the day, "But you need to understand that you don't always have to fight it; it is quite natural, this thing happening to you"
"It's okay to take a break, just go out and smell the roses sometimes", I had said in all earnestness, only to be met with her cold stare. "Honey?" I held up the wine and chocolates wishing she'd take a breather and let normalcy set in again, but in vain. "Okay-Okay, I agree I have been diseased with the dreaded writer's block, but there's nothing a glass of wine can't wash away, right? ", she said exasperatedly as she opened the bottle and once again disappeared into her fantasy world. While the above is a fictional piece, there is no denying that most of us have a lull period between our blogging/writing. I, unlike the protagonist of the story, don't fight the blogger's block, rather I acknowledge its presence and work around it. Keep the creative juices flowing - I dance, read, cook, watch movies, listen to songs and stay in the creative zone. Anything can be a trigger and before you know it you are writing again. Even strangers can inspire - I love to study the faces of Passersby when traveling. And sometimes a smile can strike up a conversation between two strangers. Before you know it, you'll be writing about the experience or creating a fictional character inspired from that someone you met. Get wordy - I have an average vocabulary but whenever I come across a new and enticing word, or a familiar word used in a unique and interesting manner, I make it a point to note it down. I browse this list every once in a while to nudge the writer in me and it has worked out fabulously. Listen to the nature - I love to watch the sky, clouds moving slowly...taking shapes, leaves changing colors, birds singing...flapping their wings...soaring high in the sky, squirrels acting quirky, flowers blooming - they all speak to you. You just have to listen to get the magic going. Sleep - Although I admit sleep doesn't come easily to me, I toss and turn for hours before entering my dream world. But a good night's sleep can help you start afresh! So there, my five ways to tackle the writer's block/ blogger's block. What do you think? Great description of that block all writers dread! Blessings! hahaha....writer's block can get the most of us to do ungodly things. Sleep is always a good tip, works for everything :) I am so glad you included it in the list here. And of course wine too! 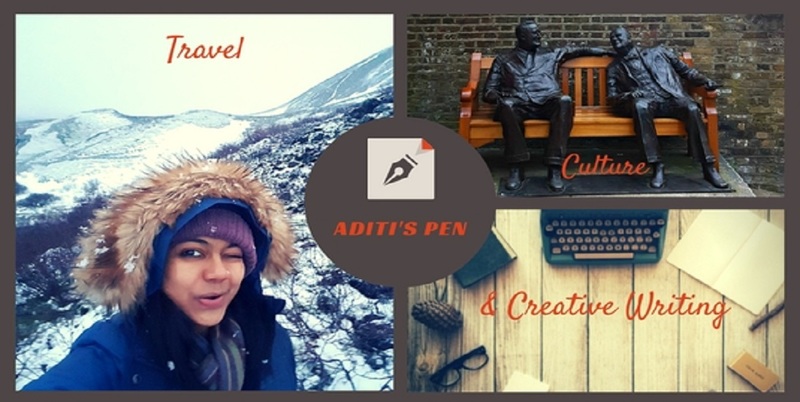 The little fictional piece was fun to read, Aditi! I'm with you on listening to nature and believe it, or believe it not, when i'm doing mundane chores like ironing and such, ides come flowing into my head! How's that for bonkers! Agree Juliette, most of the ideas flow to me when I'm at work! Yup I did! And this trick helped a lot too! Cool one, Aditi! Conveys the essence! Loved your fictional piece. And the tips were great. Sometimes taking a break does help. Thanks Sushree! You are a darling! Practical tips . I keep an eye for new words to expand my vocab. But sleep comes easily to me. Or if at first you don't succeed - write, write again! Love the imagery you used for this little story. I love your idea about watching passersby. I thought this was the next part of the story! Turned out to be WT Writer's Block Prompt. Great pointers. I liked your 'get inspired by strangers'. True, observing strangers or talking to them can be unraveling of a big story! Retrospectively, the fiction in this post gels well with the marathon story too. Was that the idea? Inspiring post! Slowly the creative bulb is blinking above me :) Very true about sleep and listening to nature. I've had six glasses of wine and it seems to have got rid of it! Nice flash read, I loved it.